No need to keep up appearances any longer. It’s TERM TWO dontchaknow…. This is going to be the worst FOUR years of non-religion in American history. 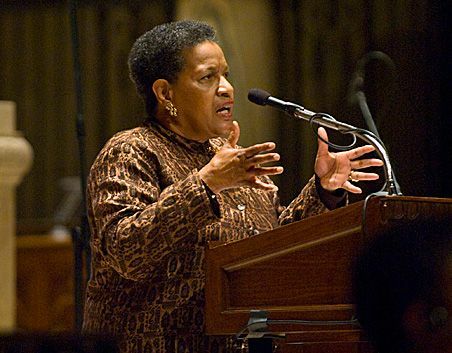 WASHINGTON DC – President Obama has picked Myrlie Evers-Williams, widow of slain civil rights icon Medgar Evers, to deliver the invocation at his public swearing-in later this month. It is believed to be the first time a woman, and a layperson rather than a clergy member, has been chosen to deliver what may be America’s most prominent public prayer. This entry was posted in A New America, Dear Leader - Creepy POTUS Worship, media bias, Obama re-election, Obama Research/Discovery, Uncategorized. Bookmark the permalink. Not watching it. He can have an imam and a Wiccan priest deliver the prayer for all I care. Just a confirmation of who he is. I agree…and I won’t be watching it either. However, when he takes the oath, I sure hope someone yells “liar” during each and every line. After all, that would only be fair and accurate. Al Salaam a’ alaykum my brother! Plenty of agenda here, on several levels. As an Athiest or Agnostic this still makes my skin crawl. Not every ceremony is about the person involved it is many times for the benefit of the community. As a historical Christian country I think it would benefit most people in the country to see the person sworn in under a Christian clergy. If the President were Jewish or another religion maybe it would be appropriate to be sworn in by clergy of that religion? Obama says he is a Christian and he says he is patriotic(well maybe he doesn’t say this) yet he pulls these types of games to further his agenda. “Not every ceremony is about the person involved…” So true! Just as a funeral isn’t for the deceased, but for the living. If a president were Jewish or a Hindu and chose to use a Torah or Gita, I wouldn’t complain as long as he held American values. It’s the hypocrisy and games of the man Obama that galls. That, and his anti-Americanism. He’s not hiding his true religious affiliation from anyone who has eyes to see. He’s still just playing that portion of the populace who just need the sop of a public prayer once every four years so that they can keep believing he’s a Christian. There’s one thing that I’m missing though…has some sea change occurred in religious circles that those who do massive good works are inherently brought under suspicion as though they can’t both speak the Gospel and do good works? That’s what Scripture indicates we should do–Eph. 2:8-10 includes the thought that we are saved by grace….so that we can walk in the good works….prepared beforehand for us in Christ Jesus; i.,e., the good works are no credit to us–we’re only able to do them because of Christ. I’m tired of Rick Warren. I’ve wondered about John Piper. I like what I’ve known of Louie Giglio…and I’m wondering now, I guess, how long is it before somebody gets ticked with Franklin Graham and Samaritan’s Purse, and accusing him of not preaching the gospel, and using all of his (money-requiring) good works to buttress their accusation. Is there perhaps a goofy equivalency being set up here? “If you’re big on good works, you’ve stepped aside from the Gospel.” That makes no sense to me, if that’s the core of this. maybe it’s something else. Just seems to be a pretty broad brush. ..he could have been a little more creative..bein’ the first gay, black muslim, socialist president..
I’m thinking… a lightning strike from Heaven, since he was sent to you from here. Oh, that reminds me. Is it true Al Roker’s forecast for that Monday in DC is “Cloudy with Scattered Sharts”? He wouldn’t dare. That would be raaaaaaaacciiiiiiiiiissss. I’m quite sure Obama is an atheist, and on the surface I have no problem at all with that. I DO have a problem though with an atheist who pretends to be a religious person so he can get votes. His choice for the prayer is a clear indication to me that he considers the prayer to be a speech, not a communication with God.